That fit our new existence to existing things.'" This is a principle that you must see running about in muddy sneakers to fully understand . . .
"Education is the Science of Relations . . . "
My children were very young when I first read this phrase, and although at the time I thought I knew what the words meant, hindsight now winks at me. I suspect that only through living with children over a course of years does one come to apprehend this principle. As my little ones slid down from my lap and landed smack in a big wide world that needed full inspection, I began to see this principle with feet on -- sometimes in those muddy sneakers, slogging in with sloshing jars of tadpoles, other times in sock feet on the sofa, mind-questing through worlds of words as I read aloud. Those feet never stopped running circles around me -- I could scarcely run apace! And I began to see that my little explorers truly were educated best by the relationships they formed first-hand with all sorts of things -- and people -- in their world. with a vast number of things and thoughts . . . "
The meaning of life is found in our relationships -- to people, ideas and creation. A life lived in a stupor of apathy and selfishness meets its empty end like TS Eliot's Hollow Man -- "not with a bang, but with a whimper." The radius of a hollow life locks down on the dull, close borders of its own needs, with no relationship to anything or anyone. But when a person forms a relationship to something, it becomes a part of his consciousness, his being. And every relationship formed redefines and expands the mind, which makes his world a bit larger, his life fuller. "On what does Fulness of Living depend? -- What is education after all? An answer lies in the phrase -- Education is the Science of Relations. I do not use this phrase, let me say once more, in the Herbartian sense - that things are related to each other, and we must be careful to pack the right things in together, so that, having got into the brain of a boy, each thing may fasten on its cousins, and together they may make a strong clique or 'apperception mass.' What we are concerned with is the fact that we personally have relations with all that there is in the present, all that there has been in the past, and all that there will be in the future -- with all above us and all about us -- and that fulness of living, expansion, expression, and serviceableness, for each of us, depend upon how far we apprehend these relationships and how many of them we lay hold of. And both with moons and tides." Every child is heir to an enormous patrimony, heir to all the ages, inheritor of all the present." To me, this principle speaks to the big question of life: why are you here? You're born, you sojourn here a while, you die, and go home to the Lord for all eternity. That part of our existence spent here on this little ball spinning around the sun is a mere pin-dot on the unfathomable timeline of eternity. So what is the point of being here? It's astounding that God created so much for so temporary a phase of our existence. Why didn't He just create us in Heaven, and skip this part? There are, of course, larger issues in this question, which are beyond our scope here. But it is fair to say that God purposed for us to gain wisdom and understanding while here. To help us along in that regard, He created an infinitely fascinating world, full of learning opportunities. Paul writes in Romans that God is clearly revealed in the things He created. And all those created things were formed by the same Hand that made us -- thus, we are related to everything that was made through the bond of our common Creator. This inherent relationship to all things is what Charlotte called affinities, which she illustrates in this principle with a phrase from Wordsworth's The Prelude "those first-born affinities that fit our new existence to existing things." Perhaps the best we can do in this brief sojourn phase of our eternal existence is use our gifts . . . enrich our affinities . . . by forming vital relationships with the things and people He created for us. "At the highest point of the picture we see the Holy Ghost descending in the likeness of a dove; immediately below, in the upper chamber are the disciples who first received His inspiration; below again is the promiscuous* crowd of all nationalities who are brought indirectly under the influence of that first outpouring; and in the foreground are two or three dogs, showing that the dumb creation was not excluded from benefiting by the new grace. In the lower compartment of the great design are angelic figures of the cardinal virtues, which we all trace more or less to divine inspiration, floating above the seated figures of apostles and prophets, of whom we know that they 'spake as they were moved by the Holy Ghost.' So far this medieval scheme of philosophy reveals no new thought to persons instructed in the elements of Christian truth. But below the prophets and apostles are a series of pictured niches, those to the right being occupied by the captain figures, the ideal representations, of the seven liberal arts, figures of singular grace and beauty, representing such familiar matters as grammar, rhetoric, logic, music, astronomy, geometry and arithmetic, all of them under the outpouring of the Spirit of God. Still more liberal is the philosophy which places at the foot of each of these figures him who was then accepted as the leader and representative of each several science -- Priscian, Cicero, Aristotle, Tubal Cain, Zoroaster, Euclid, Pythagoras; men whom a narrower and later theology would have placed beyond the pale of the Christian religion, and therefore of the teaching of the Spirit of God. But here all are represented as under the same divine outpouring which illuminated the disciples in the upper chamber." "The great recognition that God, the Holy Spirit, is Himself personally the imparter of knowledge, the instructor of youth, the inspirer of genius, is a conception so far lost to us that we should think it distinctly irreverent to conceive of the divine teaching as co-operating with ours in a child's arithmetic lesson, for example. But the Florentine mind of the Middle Ages went further than this. It believed, not only that the seven liberal arts were fully under the direct outpouring of the Holy Ghost, but that every fruitful idea, every original conception, whether in Euclid, or grammar, or music, was a direct inspiration from the Holy Spirit, without any thought at all as to whether the person so inspired named himself by the name of God, or recognized whence his inspiration came. All these seven figures [under the liberal sciences] are those of persons whom we should roughly class as pagans and whom we might be lightly inclined to consider as outside the pale of divine inspiration. It is truly difficult to grasp the amazing boldness of this scheme of the education of the world which Florence accepted in simple faith. This is the key to the whole education of each boy and girl. Practical discernment and knowledge of everyday matters, the discovery of the secrets of nature, the great inventions, every conception of beauty or truth and their expression -- all have one history, each must have been a great idea when it first made a stir in the mind of the man, woman or child who conceived it." We begin to glimpse the scope of the great banquet of affinities. Every subject represented on the fresco brings its own gifts to the human spirit. As Francis Bacon famously noted, "Histories make men wise; poets, witty; the mathematics, subtle; natural philosophy, deep; moral, grave; logic and rhetoric, able to contend." and upon many living books . . . "
. . . a full and generous curriculum, a la Principle 11 (and -- hint -- Principle 13, up next). But since curriculum particulars are not the focus of the present principle, Charlotte lists but a partial sampling so as not to distract us from the larger idea at hand. However, I can't help but note the nature of the subjects she chooses to illustrate this point -- they are all beyond the scope of utilitarian and "three R's" systems of education. Further, I take special notice of her deliberate inclusion of exercise and handicrafts. These are the only two areas that provide the child an opportunity to develop the very vital affinity for physical intelligence (as well as the wisdom to seek wholeness and refreshment in recreational activity), and ironically, they are the two areas we most often slight. "Our part is to drop occasion freely in the way, whether in school or at home. Children should have relations with earth and water, should run and leap, ride and swim . . . He must stand and walk and run and jump with ease and grace. He must skate and swim and ride and drive, dance and row and sail a boat." All in all, Charlotte was beyond the thinking of her times in this very holistic view that mind, body and spirit are inextricably fused together in effect toward overall health. Neglect of handiwork also presents the child with many unnecessary future challenges that many busy parents fail to foresee. It's in handicrafts that a child forms an ease with many work-related skills -- the use of tools, abstract planning processes, sequencing, problem-solving and so on. But perhaps more importantly, the pursuit of handicrafts provides the child a vital affinity for the satisfaction of productivity, and thus the capacity to find joy and fulfillment in his own labors (see Ecclesiastes 2:24, 3:13, 3:22). Handicrafts teach a child to take joy in the virtue of being busy in a productive way -- a most useful habit that will guide and serve him throughout life. 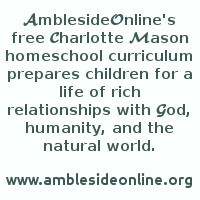 We cannot fully prepare a child for every demand of life and career, but Charlotte urges us to usher him toward an abundant life . . .
. . . and she desired that this broad enrichment of his 'first-born affinities' in childhood would result in the highest realization of his God-given capacities throughout his life. Herein we see the driving force behind Charlotte's life's work -- that children have a divinely implanted capacity to develop their "first-born affinities" for knowledge into life-long relationships. For illustration of how this looks in muddy sneakers, so to speak, she quotes at great length from Ruskin's autobiographical Praeterita and Wordsworth's The Prelude. She urges all parents to read these two works, and particularly admonishes "all rich, educated parents who live in the suburbs" to read Ruskin's, because his tales of struggling against the over-protective limitations imposed on his childhood show us, as parents, how not to do it. These works are useful in that they reveal how two renowned thinkers and philosophers came to greatness through making valid the affinities of childhood. Examples from the modern era spring to mind. Sir Winston Churchill had two childhood fascinations -- history stories, and his toy soldiers, which he tirelessly arranged by era and rank, and re-enacted historical battles. As Prime Minister of Great Britain, he became one of the greatest statesmen in world history and was a major strategist in World War II. In his last years, he wrote many definitive volumes on world history. Likewise, General George Patton was transfixed as a child on cavalry, and particularly in the military career of Stonewall Jackson. He followed in Jackson's footsteps, becoming a brilliant tank commander -- the modern equivalent of cavalry. In our own era, Homer Hickam's best-selling autobiographical novels relate how his boyhood fascination with homemade rockets paved the way for NASA's voyages to the moon and beyond. Childhood affinities are powerful! How different the world could be if all children came to adulthood bountifully furnished with worthy relationships to draw upon and grow from for a lifetime . . .
We are inspired to provide a banquet of rich ideas, without predigestion or contrivance. Relationships are personal, not vicarious -- we cannot form them for someone else. Years of living with those muddy sneakers have taught me that if I wallop my children with a prefabricated packet of facts and projects pertaining to, say, trees, they soon tire of it so that even a tree swing begins to lose its charm. Their zeal proves self-perpetuating, however, if I allow them to form those vital connections here a little and there a little. Pondering gaps are essential -- we need the grace of space, time to fit the new ideas to the relationship in progress. Over time, things pertaining to trees will naturally surface across a variety of subjects. In handicrafts they can come to know the nature of wood -- how it swells in water, how silky it feels when sanded, how it smells when sawed or burned, how it sounds hollow or solid, how it glows with polish and stain, how it responds to the pressure of a chisel, how splinters feel in the flesh. In science, they learn how the tree lives -- how it sprouts, how it feeds through photosynthesis and drinks through the mirror of itself in the roots underground, how it colors through chlorophyll and climate, how it marks time through rings. They are awed by the majesty of a tree through the strokes of master artists and the ponderings of poets. Inspired by nature lore, they plant a seedling and cheer as it bolts beyond their own height. Trees become their friends for life. As I grow older, I begin to see that, like the mind, knowledge also has the property of magical expansion. The more I learn, the more there seems to be yet to learn. As I begin to fathom how much I do not know, and thus how endless the mind of God is, I grow less certain that we can truly make knowledge belong to us. Knowledge predates us. In the sense that it all comes from God, it was here from the beginning. I note that Wordsworth took care to qualify that our existence is new, and that our affinities fit us, in our newness, to existing things. We are materialistic by nature: we want to own things. Regardless, I begin to suspect that the relationships we form to knowledge do not make it belong to us, but rather bring us to belong to what was here all along. My father once said in a sermon, "We spend our lives preoccupied with the things that belong to us. We come to believe we are defined by those things; that they will give us joy. But in the end, it doesn't matter what belongs to you. What does matter? What defines who you are? What gives you joy? Only to what--and to whom--you belong." This, for me, sums up "The Science of Relations" -- belonging to, and richly enjoying, all those things to which God blessed us with first-born affinities. "Charge them that are rich in this world, that they be not high-minded, nor trust in uncertain riches, but in the living God, who giveth us richly all things to enjoy . . . "
Charlotte urged her readers to study John Ruskin's explanation of the fresco in Mornings in Florence (online at Project Gutenberg). She devotes a whole chapter to the fresco in Volume 2 ("The Great Recognition"), and returns to it in Volume 3 (pp. 95, 125, 153) and again in Volume 6, page 322.
their help in gathering information about the fresco. All rights reserved; used by permission.